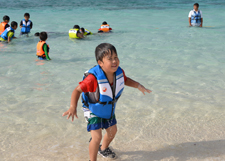 Fukushima Children’s Fund has assisted the recuperation center in Okinawa, one of its collaborative entities, arranging the recuperation program for the children who were/have been exposed to radiation. The project is designed to help the children living in radioactive contaminated areas to strengthen their immune system since we acknowledged how effectively recuperation treatments had worked on the Chernobyl radiation victims through many years of experience. The children who lived near the Chernobyl nuclear power plant are entitled to receive recuperation treatments at sanitariums in radiation free areas once a year thanks to the regulations of the neighboring states of Chernobyl. It proves that twenty four days of recuperation likely reduce internal cesium exposure by 25 – 30 percent. In addition, swimming in the sea and playing outdoors until getting muddy without worrying about radiation exposure make children feel free from stresses. By doing this, they will be healthier and will finally be strong enough to protect themselves against diseases. 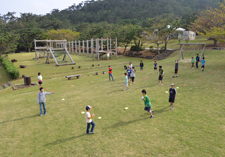 F.C.F is supporting the recuperation treatment program at Okinawa Kumi-no-sato for Fukushima children. Kumi-no-sato is in Kumejima Town in Okinawa Pref. It is open throughout the year. 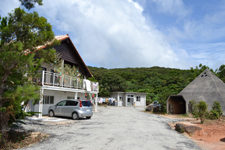 The center is located in the forested area on the hilly side of Kumejima. From there you can overlook the beautiful ocean view unique to the island. Mr. Ryuichi Hirokawa, a photo journalist first called for the need for recuperation centers. Soon after, residents of Kumejima and many others responded to his call and together they established the center. The center was opened in July 2012.
Who are to stay at the center? The children, who lived / are living in the areas seriously contaminated by radiation released from the Fukushima nuclear plant, regardless of their homes being in or out of Fukushima Pref., are entitled to stay in the recuperation center in Okinawa Pref. Each time a group of fifty or so children stay there for a few weeks. As of Mar. 2014, the total number of participants are 962 (755 children and 207their mothers). The participation fees are free for children. The round trip expenses (around 50,000 yen to 70,000 yen) are paid for by donation. The project expenses, including the facility management fees are mostly paid for by donation. *Kumi-no-sato is recruiting volunteer workers who wish to work at Kumi-no-sato in Okinawa Pref. If you are interested in helping us there, please access Kumi-no-sato HP; please read through the text messages before posting your application form and resume.